Not everything in life is about money. Yes, we need money, I’m not saying we shouldn’t work or be responsible. What I am saying is when we truly follow our passion, money isn’t the motivation, purpose is. My wise father once said, do what you love and the money will follow. His passion is cooking, singing and people. If you see my father, you see me. I probably would have followed in his footsteps and taken over his restaurant, if I wasn’t passionate about the arts. I was good in the restaurant business because I love food and people. Yet, the restaurant business wasn’t for me. My passion was the arts. I spent hours listening to the radio growing up. My mother bought me my first phonograph at the age of seven. I had 45’s and I would listen to them over and over. I would take walks from my house to Sam Goody on Queens Boulevard, where I was introduced to musicians like Al Di Meola, who is a radical guitarist and ahead of his time. I didn’t realize I had a singing voice until two musical directors from a play I was in, told me I had a beautiful voice. I thought they were just being nice, until my peers started to tell me the same thing. It was then that I started taking singing seriously and found a coach. In the midst of this, I loved to dance (still do). My mother was a professional dancer, so I started dancing as soon as I learned to walk. But, in order to get into the top clubs in Manhattan, I needed a fake ID. So me and my friends took a trip to 42nd Street and got ourselves some. It was then that I started frequenting clubs like, the Palladium, Red Parrot, Copacabana, Limelight, Tunnel, and much more. Yes, music is a passion of mine. But so is reading and writing. I started reading books and keeping a journal as a kid. I devoured books and poured my feelings out on to the page. I also started dabbling in poetry, by the time I reached High School, I submitted my poems to the school newspaper and they made it to the front page. I also drew, so I would draw something that would coincide with my poems which was a plus. But sadly, for years, I didn’t think I was a “writer”. I knew I was an actress, singer, dancer, and artist, but for some reason, I never thought I was a writer. This discovery happened later in life, when I read Jeff Goins book, You Are A Writer. If you are not sure what your passion or purpose is, I highly recommend reading his other book, The Art of Work. Jeff is a good friend, colleague and mentor of mine. I have watched him do some amazing things over the years. He is inspiration to me. If you don’t follow his blog, I recommend that you do. I have learned so much from him. If you don’t know what your passion is, you won’t know what your purpose is either, because passion and purpose go hand in hand. 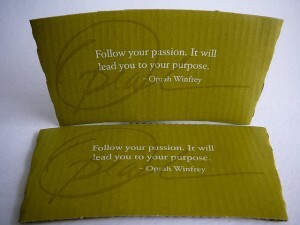 I encourage you to explore and discover what your passion and purpose is, because once you do, you will feel fulfilled. Are you struggling with knowing your passion or finding your purpose? If so, let’s discuss it in the comment section below.